I'm a self-taught artist who has always been inspired and encouraged to create. Since marrying my high-school sweetheart in 2017, I knew I wanted to stay in touch with weddings and calligraphy is the perfect avenue to celebrate beautiful details. I’m a messy creative with many passions, and art has always been one of them. Growing up, my mom always made sure that I had coloring books, art supplies, canvases, and even lessons to quench my creative thirst. In 2015, I began teaching myself calligraphy with a pointed dip pen, and it’s turned into a small side business aside from the teaching career I love. It is an honor to celebrate brides and grooms in love. Since A. Taylor Studio’s establishment, I have been honored to work with inspirationally creative brides to create one-of-a-kind calligraphy suites. I am self-taught in art and calligraphy and have always had an interest in creating. I love my home town of Bucks County, PA and have always been in awe of its beauty and history. When I'm not teaching or calligraphing, you can probably find me enjoying a strong latte, hanging out with my husband and family, brushing up on my Italian, taking pictures and traveling, or tuning in to my favorite 40s music or black and white movies. 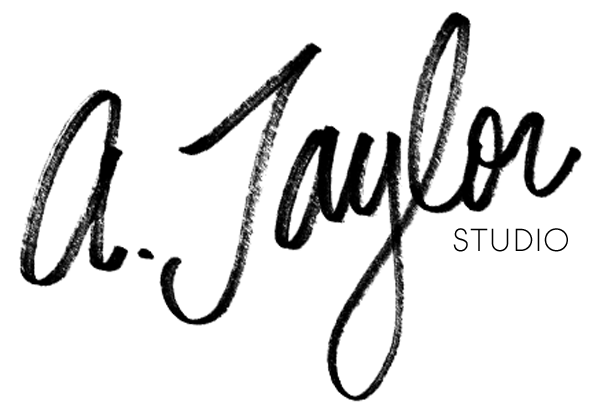 A. Taylor Studio was established in 2015 and is currently working on weddings in the greater Philadelphia area.